How far would you go to track down the truth about a brother snatched off the street by suspected government agents? For Patson Dzamara, there are no limits. Thirteen months ago, human rights activist and Giraffe Hero Itai Dzamara was abducted by suspected state security agents, and since then no one has been able to find out where he is or what has happened to him. Patson Dzamara, Itai’s younger brother, has vowed to get answers. To that end, Dzamara organized a march for human rights in general and the return of his brother in particular; it attracted thousands of students. He also established a Youth Leadership Institute, recruiting others for the fight that will doubtless continue. 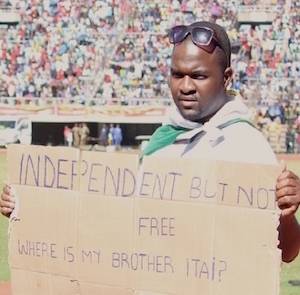 And on Independence Day, Dzamara went to the national stadium where President Robert Mugabe was addressing thousands of his supporters and did something that few would have dared to do: He held up a banner that read INDEPENDENT BUT NOT FREE. WHERE IS MY BROTHER, ITAI? This certainly attracted attention, but perhaps not the kind that Dzamara was hoping for: Security agents beat him up, and Dzamara is still nursing his injuries.